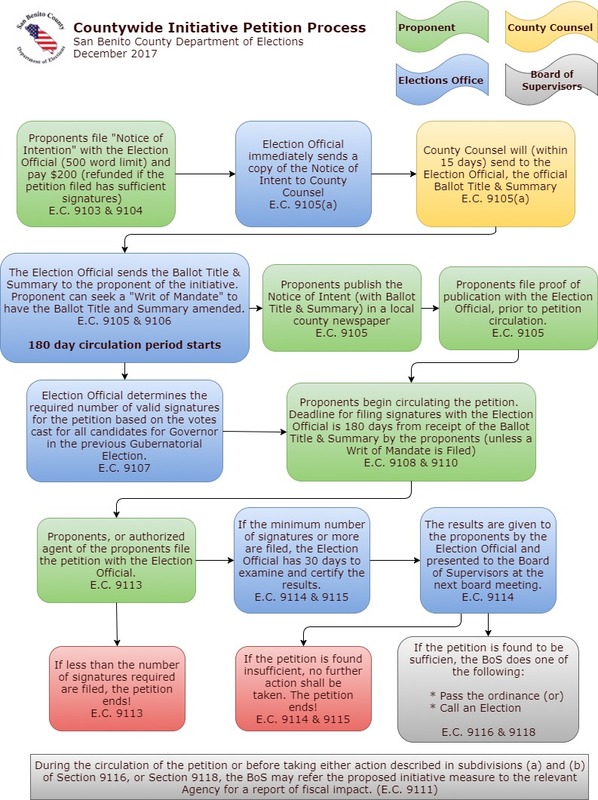 The Initiative Petition Process is outlined below. While the process is very similar for Cities, water and school districts, the details provided here are specific to countywide initiatives. The initiative process enables citizens to propose new legislation (ordinance) and pass these proposals into law by a majority popular vote. The Initiative Petition is the Voter’s means of making change. The information in this flowchart is dated 12/1/2017. It is provided as a guide. Anyone wishing to circulate a petition should verify with the San Benito County Department of Elections prior to beginning the process. Please feel free to make an appointment for a consultation with the department.